The first weights of Neue Haas Grotesk were designed in 1957-1958 by Max Miedinger. The typeface was later revised and released as Helvetica by Linotype AG. As Neue Haas Grotesk had to be adapted to work on Linotype’s hot metal linecasters, Linotype Helvetica was in some ways a radically transformed version of the original. 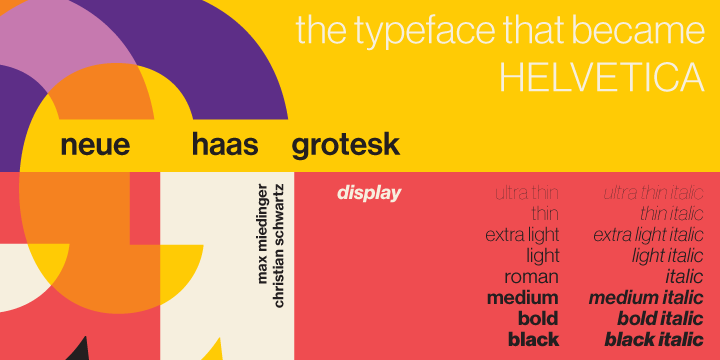 Christian Schwartz says “Neue Haas Grotesk was originally produced for typesetting by hand in a range of sizes from 5 to 72 points, but digital Helvetica has always been one-size-fits-all, which leads to unfortunate compromises.” Schwartz’s digital revival sets the record straight, so to speak. What was lost in Neue Haas Grotesk’s transition to the digital Helvetica of today, has been resurrected in this faithful digital revival. The new Neue Haas Grotesk, comes complete with a number of Max Miedinger’s alternates, including a flat-legged R. With eights weights, from a refined extra thin to a robust black, the Neue Haas Grotesk family is highly versatile. The Thin weight (originally requested by Bloomberg Businessweek) is very fine, very thin indeed, and reveals the true skeleton of these iconic letterforms. This entry was posted in Font Highlight and tagged alt.TYPE, fonts, Helvetica, Neue Haas Grotesk on January 10, 2013 by alt.TYPE. MUSEO … it all started with Dutch designer Jos Buivenga’s love for U. One day this uppercase letter U just came to him as an image in a daydream. He saw the top of both stems bended into semi-slab serifs, and from that principle, he worked out the rest of the uppercase letters. His first intention was to make it an all-caps display font but after a few months he changed his mind. 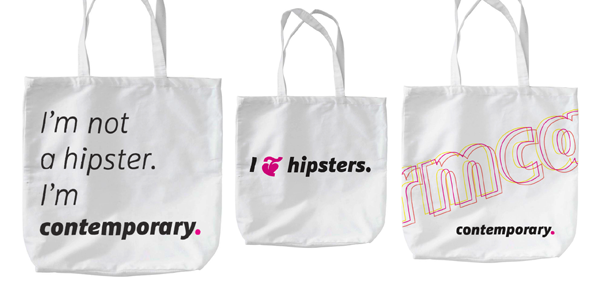 He wanted it to be a bit more versatile and added lowercase, adjusted spacing and kerning to increase legibility. 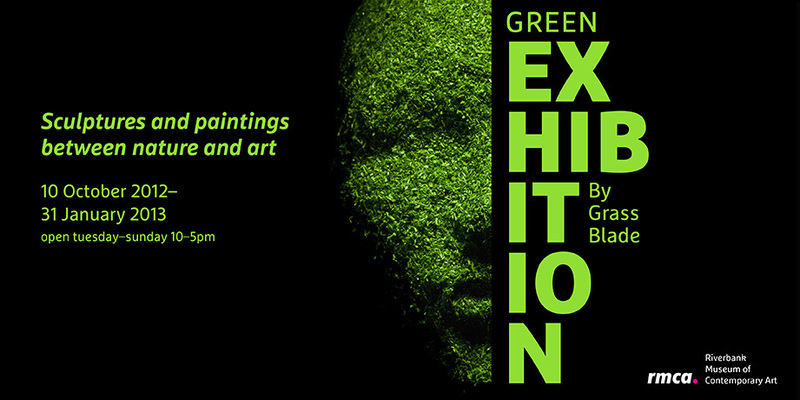 The end result is a contemporary semi-slab serif font family with five weights, designated as 100,300,500,700,900. 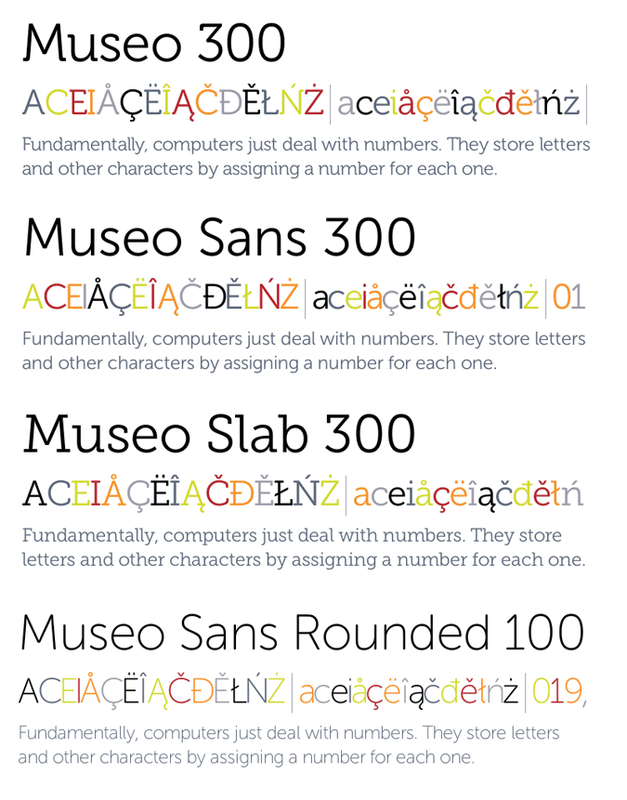 After creating the original Museo, Jos Buivenga went on to create Museo Sans, Museo Slab and Museo Rounded. 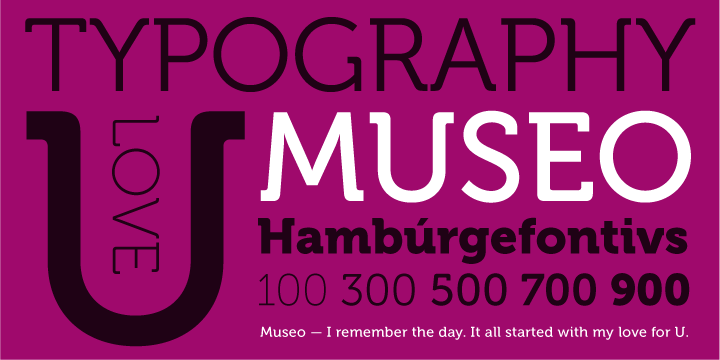 The diversity of styles within the Museo family ensures that the typeface has a wide range of potential applications. This entry was posted in Font Highlight and tagged alt.TYPE, alttype, fonts, Linotype, Monotype, Museo, Museo Fonts, Museo Rounded, Museo Sans, Museo Slab, Myfonts, singapore on October 23, 2012 by alt.TYPE. 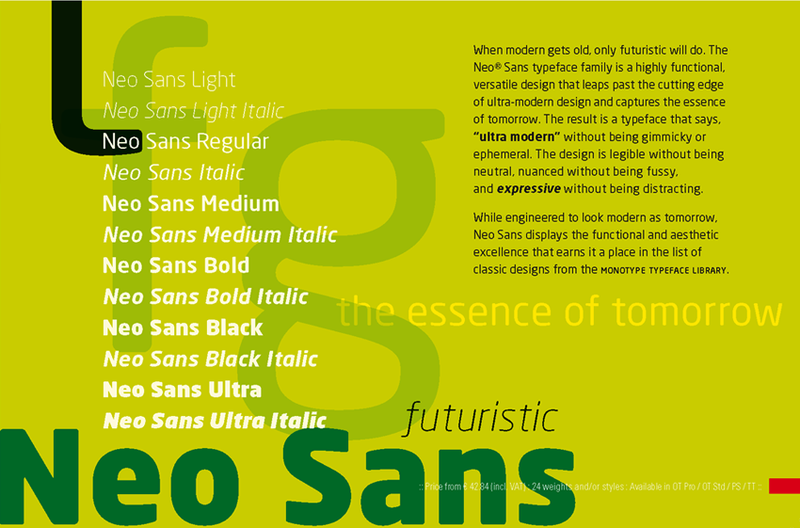 The English designer Sebastian Lester created the Neo® Sans and Neo Tech typeface families for Monotype Imaging in 2004. Later in 2005, Intel commissioned the creation of a custom Neo font, Neo Sans Intel, for its rebranding. The British Labour Party has also used the font in branding and advertising, as have Kia Motors, Virgin Trains and the UK ITV network. The sleek Neo design also appealed to the Valve Corp., which used the typeface for its 2010 Alien Swarm freeware game. In 2010, Neo Sans was selected as the official typeface for the 2010 Vancouver Winter Olympics because of its timeless, modern quality. To order fonts, please email info@alttype.com.sg. This entry was posted in Font Highlight and tagged alt.TYPE, alttype, fonts, Linotype, Monotype, Myfonts, Neo Sans, Neo Tech, singapore on October 19, 2012 by alt.TYPE. FF Marselis crossbreeds geometric and humanistic forms, creating a freshly dynamic sans serif family. 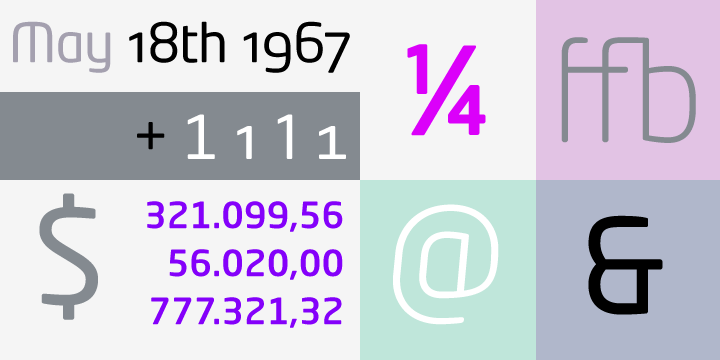 The family includes four weights – Light, Regular, Bold and Black. Each weight has a companion italic. FF Marselis is the selected corporate typeface for Brussels Airport. Its warm, soft and curvy features are a radical departure from the neutral, matter-of-factly or more technical-looking alphabets usually found in airports. The typeface works very well from gigantic display sizes, where the curved diagonals and typical teardrop-shaped counters define its personality, down to the smallest body text. FF Marselis is used in the logo as well. Designed by Megaluna, the branding and design leg of multidisciplinary agency The Factory Brussels, the new identity of Brussels Airport is striking, and beautifully illustrates the versatility of FF Marselis. 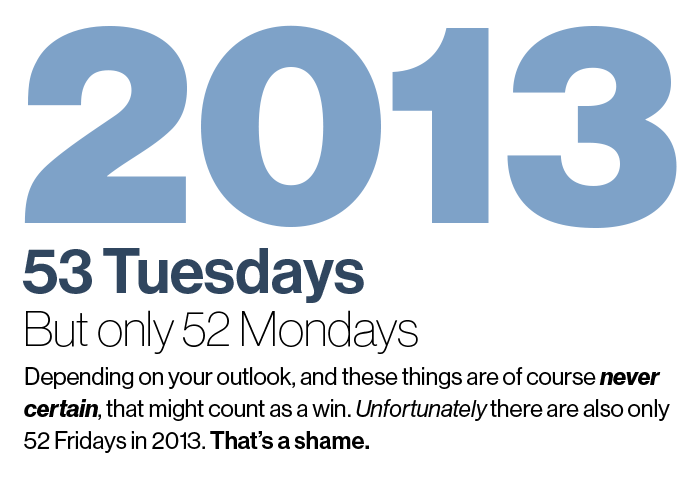 It also makes a strong case for corporate branding, specifically for such a large entity, to look less “corporate”. This entry was posted in Font Highlight, Sans Serif Typefaces and tagged alt.TYPE, alttype, FF Marselis, Fontfont, fonts, singapore on October 17, 2012 by alt.TYPE.